It has been 100 degrees the past week and soup is definitely not the first thing that comes to mind to cool me down. But, there is just something about this soup that I couldn't turn down. It takes less than 10 minutes to throw together and once it's in the crock pot, you just walk away and in eight hours you have a super yummy soup. Well, it's more like a stoup. Stoup = stew + soup. Maybe it's more like a taco chili. Regardless, you must try this and you won't believe how good it tastes for how easy it was. Promise! First of all, don't let the Weight Watcher's part scare you. This doesn't mean the soup is flavorless or gross. In fact, it's the complete opposite. I don't know how many of your out there have done Weight Watchers (but I am sure you at least know one person that has), but it's a great program. I won't go into my whole commercial, but it's really great. I was quite heavy back during my younger years right before college and with a little push from my doctor and family, I decided to join. Let me tell you, it was the best thing I ever did. Seriously. It was a long and hard year, but I lost over 100 pounds! Oftentimes people don't believe me when I tell them that, but it's true. I'll show you the pictures! Well, not really. Just trust me, okay? I just wish they had this soup recipe when I was doing it. I lived off of their veggie soup and to this day, I still love it. So, I knew this one had to be just as good. This soup consists of just a few ingredients and it can feed a family of four for under $15. Maybe even less depending on the store you shop at. All you need is a pound of lean ground beef (or ground turkey breast), a few cans of beans, corn and tomatoes, onion, garlic (the original recipe does not call for it, but I put garlic in everything) and a packet of taco seasoning and a packet of Hidden Valley Ranch mix. The latter sounded really strange, and to be honest, kinda gross (who puts ranch in taco soup?! ), but I went with it anyways. If you are worried about salt content with the canned foods and packets, try to get low sodium beans, corn and taco seasoning. That's what I did. Unfortunately, the ranch packet doesn't come in a low-sodium option. Darn. From there, chop the onion and garlic, brown the beef and then dump everything from the cans (juice and all - don't rinse!) and seasoning packets into the crock pot. Give it a good stir, pop on the lid and then set it on low for at least eight hours. That's it. SUPER EASY. This soup on it's own is about 250 calories (or 6 WW+ points) for one cup. One cup may not seem like a lot, but trust me, it's really filling with all the meat and beans. And that ranch packet I was all worried about was not gross after all. You could taste a bit of a tang on the back of your tongue, but it wasn't like taco soup with ranch on it. Was I the only one worried that it would be? Probably. Top it with some low-fat cheese, light sour cream, and a little avocado and you are good to go. Don't forget to add a few homemade baked tortilla chips too - here is how you make them! Just a warning - those add more calories though - so if you are watching them, look for high fiber tortillas. 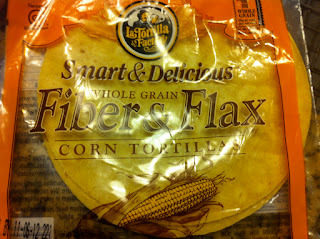 My favorite ones come from La Tortilla Factory - Whole Grain Fiber & Flax. Just 90 calories for two! Best tortilla bang for your buck if you ask me. these are the best corn tortillas! only 90 calories for 16 chips. winning! Brown the meat and then drain excess fat on a paper towel. Without draining, add all canned ingredients into a crock pot and then add in the onion, garlic, seasonings and cooked meat. Give mixture a stir and then turn on low for at least eight hours. If you don't have a crock pot, you can also do this on the stove. Just put everything in a big pot, cover slightly and simmer for at least an hour. Bonus - for an added kick, add a can of diced green chilies. OLE! The Great Food Blogger Cookie Swap - Year Two!